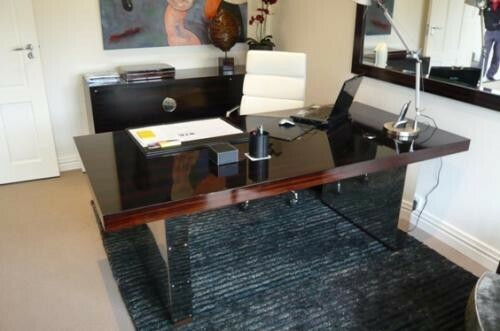 1960's styled desk in high gloss Macassar with 2 hidden drawers. The uprights are nickel plated with exposed nickel screws. Computer wire port on desk top is also nickel. The cabinet made to match has a Bainbridge custom made handle on 2 doors along side a bank of drawers. The office accessories are supplied by Bainbridge, incorporating the client's own favorite pieces.